When a person dies or is killed due to the negligence or misconduct of another, including murder, the surviving members of the victim's family may sue for "wrongful death." Although a successful wrongful death suit can't bring the loved one back, it can allow the victim's relatives to receive compensation for their loss. A wrongful death lawsuit can be brought against an individual, business or any other entity that is liable for the individual's death. However, there are specific criteria that must be met to file a case. Although wrongful death lawsuits should be filed as soon as possible, our trial lawyers can assist you if the incident has occurred in the recent past. For example, three years after the deadly tank explosion in Soulard, Missouri, the family of Tonya Gonzales is now suing the six companies involved. Dealing with the legal issues after a tragic loss is confusing and made more difficult by the grief you are experiencing. Insurance companies may try to take advantage of your vulnerable state in order to get you to settle for a reduced amount. Our experienced lawyers will help you navigate this difficult time and assist you in finding justice for your lost loved one. If your family has lost a relative as a result of another's negligence, you need a strong advocate who understands what you are going through and can provide trusted guidance. We are ready to advise and assist you during this difficult time. 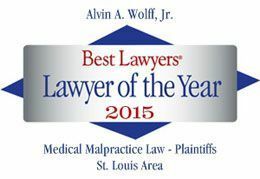 At Wolff & Wolff our St. Louis, Missouri office proudly serves the St. Clair, St. Charles and surrounding communities in wrongful death lawsuits. Contact our expert team now at (314) 241-2500.